Giveaways - what's going on? 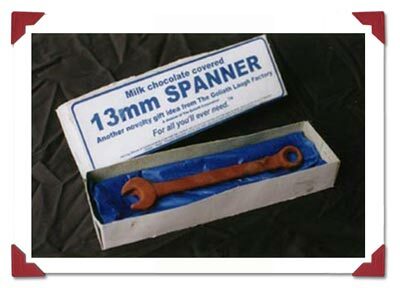 "13mm Chocolate Spanner" 6X4" photo, 100 editions. 1-80 in colour, 81-100 in B&W. For some unfathomable reason, I thought it would be fun to place 'easter egg' pictures in some of the copies of the books I have signed. If only I'd known the work involved. Still, it is quite good fun, and hopefully the 'Nextian Universe' giveaways will adapt and evolve into something genuinely with merit. Since I am a Archiveamaniac, I kept notes on how many I printed, where they were from, and, when I knew, who I actually sent them to. Some have no limit on the numbers I do of them, others are very limited indeed. Mistakes may have crept in, but there are, according to the Fforde records and as of January 2009, 254 different thingies out there, ranging from the 500-edition postcards (TEA027, LGB038, etc) to the one-of-a-kind boxed chocolate spanner featured above - in total, about 50,000 widgets of one sort or another. Oh yes, before anyone asks (and they do, I assure you) I do not sell these, deal in them or know where to get them now - sorry.